My topic is one that brings light to a topic that most people have trouble discussing. It addresses something that is sadly very common today. My topic was how divorce affects children of various ages. My topic was a learning stretch for me because my parents are recently divorced and talking about it, is hard for me. My knowledge of divorce was only what I knew from personal experience such as that it can lead to depression. I know that divorce is a serious topic and it needs to be made easier on the children. This topic is so important to me because I did not know anything about divorce when my parents split up and because of that it was ten times harder on me. I want people to know that they are not as alone as they feel. There are people in this world that understand what you are going through. 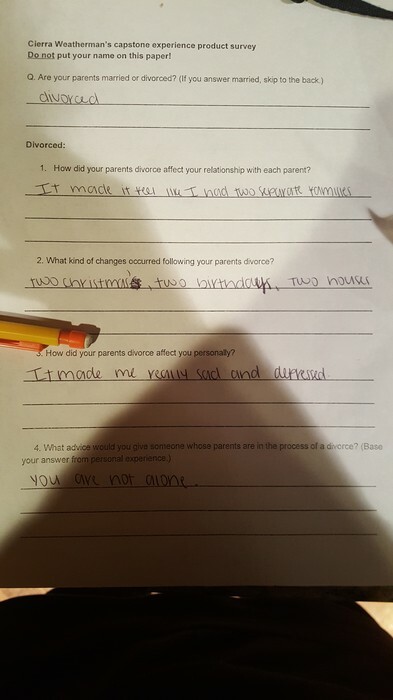 Through doing this topic, I learned how to cope with my parents divorce. I also learned that what I am feeling is completely normal. My biggest problem with my Capstone Experience was coming up with a good product to do my topic justice. My topic was very unique and unlike most products, there is no foundation that donates to children with divorced parents. It took me days to finally come up with the idea of a survey and a brochure. It took the help on my teacher and my expert to come up with the idea. I was so caught up with the fact that I couldn’t do a fundraiser that I was not allowing myself to think of any other ideas. I learned that you have to have an open mind when it comes to problem solving. I like the way that my Capstone Experience turned out in the end I would not change a thing about it. I chose Mrs. Rash as my expert because she was there for me when my parents first separated. She was a huge part in my recovery after my parents divorce. She knows a lot about divorce because she is a psychology teacher. 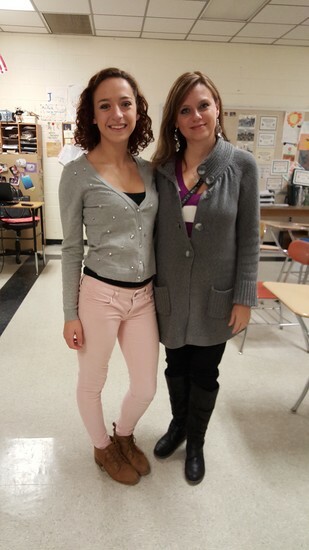 I took psychology my junior year and she taught me a lot during that class along with the added knowledge that she taught me throughout my Capstone Experience. She taught me that it is okay to grieve. My expert helped me come up with my product. She instructed me on who to contact and how to begin my project. 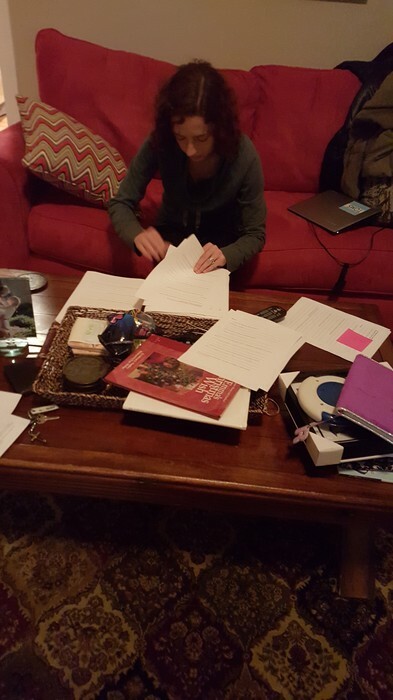 Through doing the Capstone Experience, I was able to realize that I am over my parents divorce. I learned that I would rather move on than stay stuck in the past. I learned a lot about my topic such as, divorce affects everyone differently and age does matter when it comes to divorce. I feel like I am going to be able to talk more freely about my parents divorce. I want to be able to help people whose parents are getting divorce. I feel like if I can show someone that they aren’t alone, they will be able to cope better with their parents divorce. Overall, the Capstone Experience had a positive impact on me and my future. 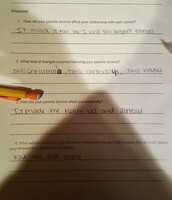 One of the many surveys I had done by a high school student with divorced parents. 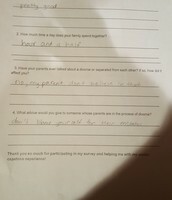 A survey done by a middle schooler. 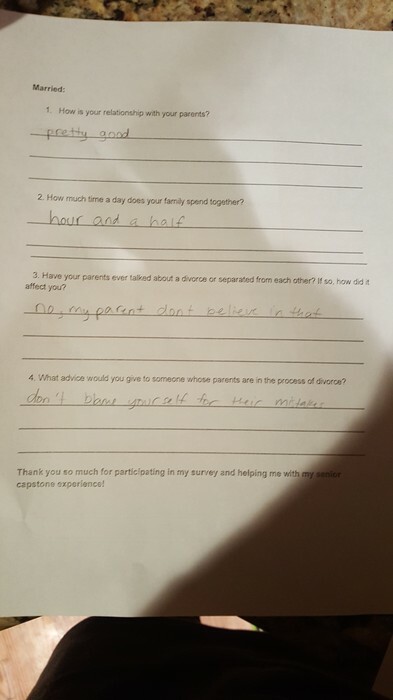 This is a survey done by a child in middle school whose parents are still together. I had to sort out 600 surveys to go to schools around me. 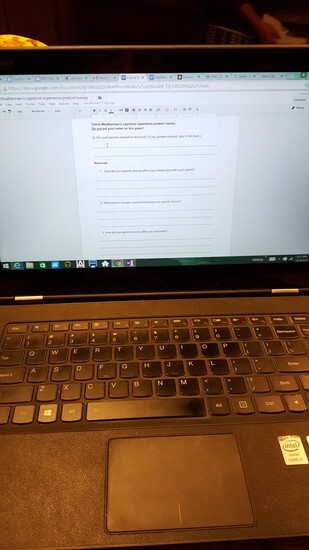 It took me forever to come up with a way to do my survey. 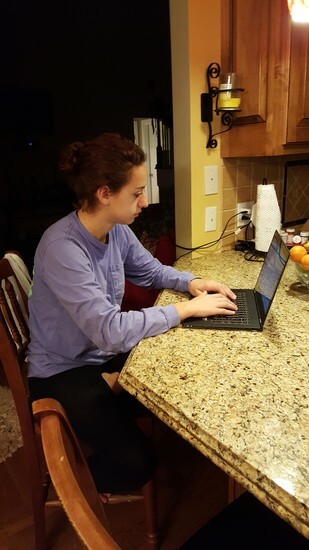 This is me typing my results up about my project. Mrs. Rash was my expert. 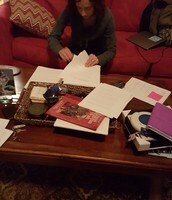 Working with Mrs. Rash on my brochure.